The Mersey River in Kejimkujik National Park in Nova Scotia, Canada is one of the prettiest places for canoeing where the tranquility of the wilderness surrounds you. Wildlife calls come from the depths of the forests while other animals lurk around the riverbanks in search of food or water. Many visitors to Kejimkujik National Park will venture out on the Mersey River on a day trip, but other canoeing enthusiasts take to the wilderness of Nova Scotia for a week or two at a time. 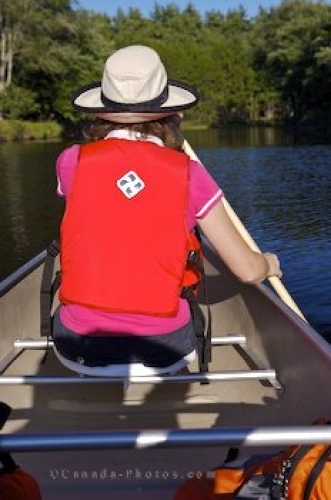 This woman paddling the canoe has the proper grip on the paddle for a smooth journey and is safely attired in a life jacket and sun hat. During the summer, the sun can become very intense while traveling the Mersey River and protection is the only way to ensure a safe adventure while exploring different areas along the banks. Picture of a woman canoeing the Mersey River in Kejimkujik National Park in Nova Scotia, Canada.